Got a question about Viva® Towels? We’ve got answers! Where can I find my favorite Viva® Brand products? Or you could ask that neighbor of yours. You know that one with the great taste and style? How do I unsubscribe from Viva® emails? Was it something we said? Well, just know that we hate to see you go! Is it safe to use Viva® Towels in the microwave? It’s always best to practice safe microwaving. That’s why we recommend that you follow the precautions and guidelines outlined in your microwave oven owner's manual. Do not dry herbs, vegetables or flowers on paper towels in the microwave oven. Any paper product can burn during microwave cooking if conditions are right. Are the original Viva® Towels going away? Maybe when science finds a way to eliminate dust and bacteria forever. Until then Viva® Vantage® Towels are available. What happened to Viva® Vantage™? We’ve got some bad news. Unfortunately we no longer carry Viva® Vantage™ towels. However, Viva® Multi-Surface Cloth™ is here and ready to win a place in your supply closet. Multi-Surface Cloth™ is strong and more versatile than Vantage™ with a texture that works on any surface you can think of. So whether you’re wiping down the windowsills or cleaning up the countertops, Viva® Multi-Surface is sure to become your new favorite. Are Viva® Brand Towels flushable? No, the towels are not flushable. If you run out of TP, we have some good suggestions. Is it safe to use Viva® Pop-Ups™ with food? Yes, these towels are safe to use with food preparation. What’s cooking? Do Viva® Pop-Ups™ come in different sheet counts? No, only one 60-sheet count option is offered at this time. Let’s talk at a later date. 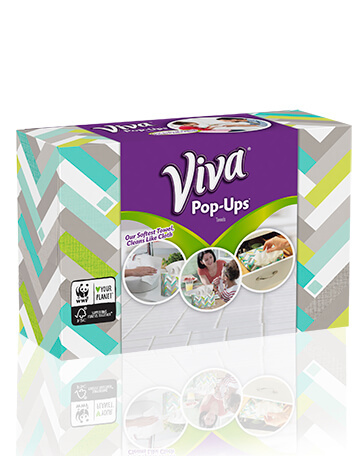 Besides making everyday cleaning easier, Viva® Pop-Ups™ are a cloth-like towel that’s dispensed one at a time so they’re easy to grab and always within reach. They’re also great to use as napkins. Additionally, they come in a box, so it’s easy to take them anywhere. There’s really no reason not to choose them! Does the Viva® Brand practice sustainable forestry management? Kimberly-Clark Corporation, the makers of Viva® Brand paper towels, is very committed to sound forest management practices. Through sustainable forestry and woodland protection plans, we ensure the continued health and productivity of the vital natural resources we manage. Kimberly-Clark’s fiber suppliers ensure that all harvested forests are replanted or naturally regenerated. We also practice resource recovery by recycling waste materials and products that do not meet our quality standards. That’s a mouthful, but we thought you should know! What is the recycle code for the wrapper? Cartons can go in curbside recycling along with paper. Pretty neat, huh? Are Viva® Brand Towels made from recycled materials? Glad you asked! Our cardboard cores utilize 100% recycled paper. The good news is the over wrap is a recycle code #4. These are the types of plastic that can be recycled at stores with other plastic bags. The carton is a recycle code #7. These can be recycled with curbside pickup, or by placing them into the appropriate recycling bin.